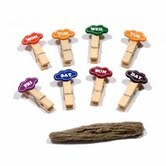 These adorable wood clips are a great product for organizing chores, schedules, or staff at home or the office. It's a stylish spin on a classic organizational item that can add a design element to any space -- at a very good price! Eight clips per set, and one long string to hang your clips on. WIN: 24/7 MOMS and Sorting with Style are giving away a set of Days of the Week Clips. **We received a complimentary Days of the Week Clips for review no financial compensation was received. i'm a subscriber! these rock! cdziuba@aol.com SO cool and useful. This would be perfect for my daughter!! !I am an email subscriber!! I am a subscriber! Looks like a great learning tool! Cool...I can always use some help with organizing! I am an email subscriber!